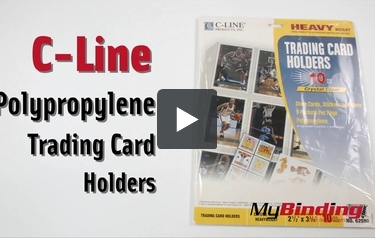 C-Line Polypropylene Trading Card Holders are protective card holders. Polypropylene material offers acid-free, permanent storage that ensures no materials will lift off from the images. The heavyweight protectors offer extra durability for permanent storage of frequently used materials, the ideal product for long-term use. It's the perfect product for storing trading cards, stickers, rubber stamps, embroidery floss, etc. You're certain to find a sheet protector that meets your needs, no matter what job you're trying to accomplish. C-Line's sheet protectors are available in a variety of materials and finishes and are designed to protect your documents day after day, no matter how often they're handled. Remember, with all C-Line's top loading sheet protectors-no sheet punching is necessary. Insert Size: 11 1/4 x 9"
Transcript: Welcome to MyBinding.com. These are the Polypropylene Trading Card Holders from C-Line. Welcome to MyBinding.com. These are the Polypropylene Trading Card Holders from C-Line. Guarantee the best protection for your most beloved trading cards with C-Lines Trading Card Holders. High quality polypropylene materials offer acid-free, archival quality, permanent storage. No sticking to the protector, no print transfer to the material, just long lasting protection. Each sheet has nine 3.5x2.5” sized pockets and are crystal clear on both sides. They’re all punched for 3 ring binders and the strong material resists any damage from turning on binder rings. Use them for trading cards, stickers, stamps, embroidery floss or any other application you can think of.